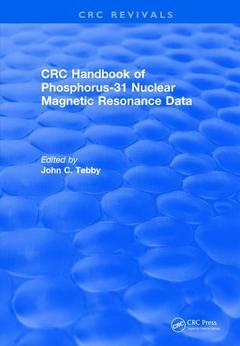 Handbook of Phosphorus-31 Nuclear Magnetic Resonance Data (1990) Tebby John C.
Add to cart the livre of Tebby John C.
To fully utilize Nuclear Magnetic Resonance (NMR) spectroscopy, a comprehensive and well-organized compilation of NMR data is necessary. While compilations have been available for other important NMR nuclei, such as carbon and fluorine, no comprehensive collection of data has been prepared for phosphorus-until now. The CRC Handbook of Phosphorus-31 Nuclear Magnetic Resonance Data provides a collection of 31P NMR chemical shifts for nearly 20,000 organic and inorganic phosphorus compounds. Each class of phosphorus compound is discussed. Bond types, stereochemistry (with the exception of metal complexes), media, important coupling constants, and data sources are included. The information is systematically organized according to coordination state, the atoms bound to phosphorus, and their connectivities. A comprehensive series of bar charts is also included to allow structure types to be assigned to chemical shift data. This handbook is an invaluable resource for all scientists working with phosphorus compounds, including chemists, biochemists, medical researchers, and pharmaceutical chemists. 1.Use of the Handbook and General Trends 2.31P NMR Data of One and Two Coordinate Phosphorus Compounds 3. 31P NMR Data of Alkali Metal Phosphides 4. 31P NMR Data of Three Coordinate (l3 s3) Phosphorus Compounds Containing Phosphorus Bonds to Halogen 5. 31P NMR Data of Three Coordinate (l3 s3) Phosphorus Compounds Containing Bonds to Chalcogenides (O, S, Se, Te) But No Bonds to Halogen 6. 31P NMR Data of Three Coordinate (l3 s3) Phosphorus Compounds Containing Phosphorus Bonds to Group V Elements (N, P, As, Sb) But No Bonds to Halogens Nor Chalcogenides 7. 31P NMR Data of Three Coordinate (l3 s3) Phosphorous Compounds Containing Phosphorus Bonds to Group IV Elements and Hydrogen Only 8. Three Coordinate Five Valent (l5, s3) Compounds 9. 31P NMR Data of Four Coordinate Phosphonium Salts and Betaines 10. 31P NMR Data of Four Coordinate Phosphorus Compounds Containing a P=Ch Bond but No Bonds to H or Group IV Atoms 11. 31P NMR Data of Four Coordinate Phosphorus Compounds Containing a P=Ch Bond and One or Two P-H Bonds 12. 31P NMR Data of Four Coordinate Phosphorus Compounds Containing a P=Ch Bond and One P-C Bond 13. 31P NMR Data of Four Coordinate Phosphorus Compounds Containing a P=Ch Bond and Two P-C Bonds 14. 31P NMR Data of Four Coordinate Phosphorus Compounds Containing a P=Ch Bond and Three Bonds from Phosphorus to Group IV Atoms 15. 31P NMR Data of Four Coordinate Phosphorus Compounds Containing a Formal Multiple Phosphorus Bond to a Group V Atom 16. 31P NMR Data of Four Coordinate Phosphorus Compounds Containing a Formal Multiple Bond from Phosphorus to a Group IV Atom 17. 31P NMR Data of Four Coordinate Phosphorus Compounds Containing a Formal Negatively Charged Atom a to Phosphorus 18. 31P NMR Data of Phosphoranides 19. 31P NMR Data of Five Coordinate (l5 s5) Phosphorus Compounds 20. 31P NMR Data of Six Coordinate Phosphorus Compounds. Index. Chemists, Biochemists, Medical Researchers, Pharmaceutical Chemists.